"Investing in yourself pays lifelong dividends." 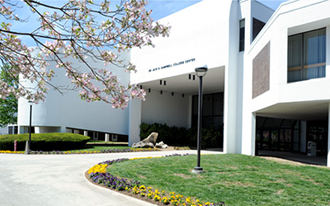 Established in 1970, Walters State Community College (WSCC) is a comprehensive, higher education institution serving over 6,000 credit students and over 4,000 students enrolled in job-training courses. The college serves a primary ten-county service area consisting of Claiborne, Cocke, Grainger, Greene, Hamblen, Hancock, Hawkins, Jefferson, Sevier and Union counties. It also has an expanded service area which includes other East Tennessee counties for public safety and health programs. Walters State offers associate of arts, associate of science and associate of science in teaching university parallel degree programs for students planning to transfer to four-year colleges or universities in pursuit of baccalaureate degrees. The college also offers associate of applied science degrees and technical certificate programs for those who plan to enter the job market after graduation. Walters State holds the distinction of being recognized as a 2015 Military Friendly® higher education institution for exemplary practices in recruiting and supporting post-military students. The college has an open admissions policy and offers credit for life experiences.